Love Varnish: Too Fancy Lacquer Here Comes September! Too Fancy Lacquer Here Comes September! Hi loves! How's your Saturday? Hope you enjoyed it :-). I had a fun afternoon, doing my friends nails, lunching and shopping. Bought new shoes, a very comfy warm knitted cardigan and some other fun things, so yay! Today I have another Too Fancy Lacquer beauty for you. This was the only thing I had left edited already and I am just too lazy to edit something else. But I don't care if it's 2 days of Too Fancy Lacquer, I love this indie! 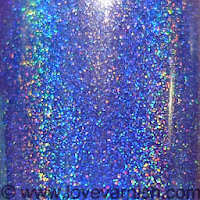 Carmen created this lovely periwinkle blue holo to celebrate September, which is her birthday month. I couldn't think of a better way to celebrate your birthday than with your own, special, stunning polish! This is a limited edition polish and I am not sure if she'll bring it back again, but it is too beautiful not to show. Previous polishes from Too Fancy Lacquer were made with a base that has a very typical smell, quite heavy and too noticable for some to handle. This batch was made with the new base and it doesn't smell anymore! Obviously you are still working with chemicals so it doesn't smell like cotton candy or anything, but it isn't any worse compared to other polishes. I did feel like this base dries a bit less shiny, if you wouldn't wear topcoat that might be something to take note of. I took pictures with and without topcoat but you can't really tell in the pictures I think. I needed 2 buttery coats and it applied heavenly. So stunning! I really like this is holo but not too strong so the color still shows through very well. 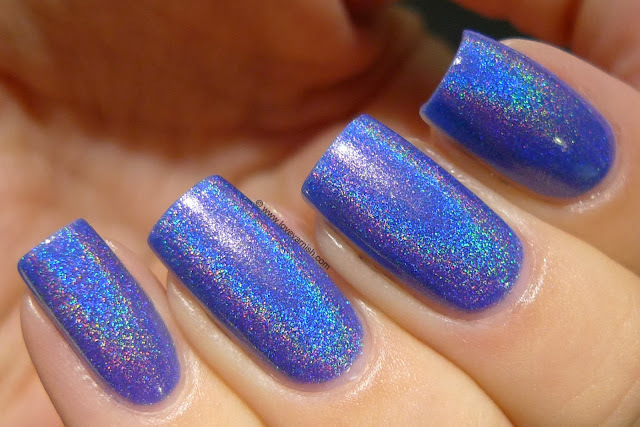 What do you think of this holo polish? Tell me in the comments! Too Fancy Lacquer is a handmade indie brand based in Hong Kong. The formula is 3 free (no formaldehyde, toluene and dibutyl phthalate). The current batches are made with a base that has a typical smell, similar to the old ILNP formula. In the future the base will be changed. Once the current stock is gone, all polishes released will have a new base (not smelly!). Polish prices vary from $8,50 to $9,50, shipping is available for international customers at a very reasonable price ($3,50 for the first one and $0,80 for each polish you add). You can find Too Fancy Lacquer on Etsy, Facebook, Twitter and Instagram. Ohh, deze is echt heeeeel erg mooi! Prachtige foto's ook (als altijd)! This is gorgeous! September is also my birth month and I love this. Whoa, this is really really gorgeous! My mind is blown *_* Awesome! It is stunning huh? I hope she releases it again, shipping is very cheap! Heel erg lief, dank je!! Thank you Melissa, I love it too! Thanks so much Lexie :) I appreciate it! Thanks Michelle, I think so too :). This doesn't surprise me at all :D!